Jaune Quick-to-See Smith, King of the Mountain. Diptych, 72 x 96 in. COLORADO SPRINGS, CO.- A major exhibition of Jaune Quick-to-See Smiths paintings and works on paper will be on view at the Colorado Springs Fine Arts Center at Colorado College Oct. 27, 2018-Feb. 10, 2019. This exhibition was organized by the Yellowstone Art Museum in Billings, Montana. Jaune Quick-to-See Smith is one of the U.S.s finest Indigenous talents. Smith is a mature, late-career artist with extraordinary aesthetic, intellectual, and curatorial achievements to her credit. She mines her cross-cultural experience and Salish-Kootenai identity, and spans cultures with powerful, idiosyncratic results of high aesthetic caliber. Few Native artists have worked with such grace, inventiveness, and aesthetic success between cultures and art worlds. 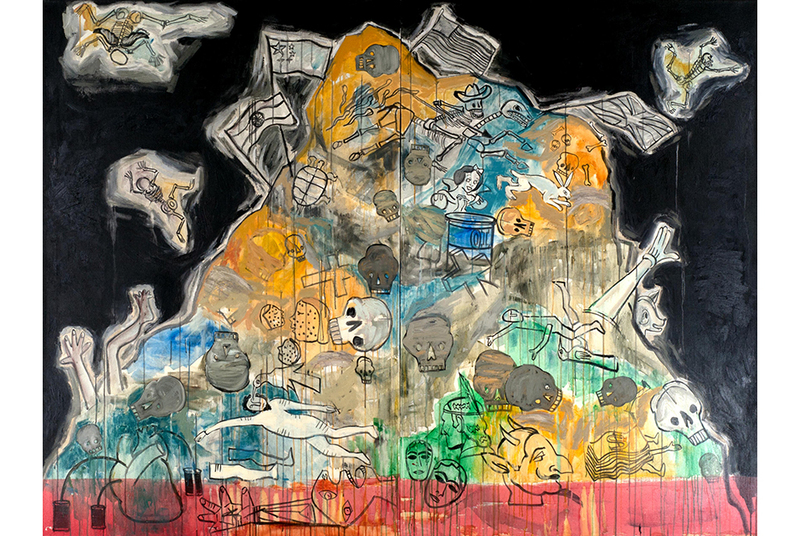 Smith has an international reputation with a strong, clear body of work; she has earned her leading standing among women artists and Native American artists while simultaneously aligning both of these often still marginalized groups more closely with the mainstream art world. In the Footsteps of My Ancestors examines themes that perennially recur in her work, including conflict, compassion, peace, the cycle of life, irony, and identity. Smith has always operated on a cusp  culturally, temporally, aesthetically, and from a gender perspective  which gives her work an attention-getting vitality, originality, and relevance. Her role in the shift toward deepening respect for Native American contemporary art in its own right has been significant. She describes herself as a cultural arts worker. Smith also has credits as a curator, writer, speaker, and leader in the arts. Jaune Quick-to-See Smith has over a hundred solo exhibitions in 28 states to her credit, from California to Florida and from the northern Plains states to Texas. She has also exhibited internationally and in dozens more group exhibitions worldwide. In addition to holdings in museums in Montana (the Yellowstone Art Museum and Missoula Art Museum in particular), her work is held in the permanent collections of such notable institutions as the Albuquerque Museum of Art, Baltimore Museum of Art, Detroit Institute, Denver Art Museum, Indianapolis Art Museum, Metropolitan Museum of Art, the Museum of Modern Art, the National Museum of the American Indian, the Smithsonian American Art Museum, and the Walker Art Center. Smith has four honorary Ph.D.s and sixteen major awards, including National Academician, New Mexico Governors Award, a lifetime achievement award from the Woodson Foundation, a Wallace Stegner Award, and a Joan Mitchell Foundation award. The exhibition will be accompanied by a catalog with contributions by notable essayists Lowery Stokes Sims and Gail Tremblay. The exhibition includes 44 paintings and works on paper from the artists collection, the Yellowstone Art Museums permanent collection, and other private collectors.